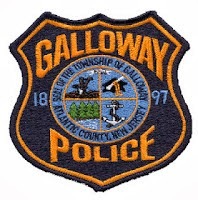 Galloway Township Police responded to 834 calls for service during July 20, 2014 through July 26, 2014. Additional statistics include: 4 Burglaries, 13 Motor Vehicle Accidents, 55 Tickets issued, 3 Driving While Intoxicated, 38 Arrests, 11 Domestic Violence, 9 Fire Calls, 77 EMS Calls and 0 Juvenile calls. Alice H. Lee, 27, of Buena was arrested by Ofc. John Mooney for DWI on July 20. Alexander D. Collarin, 38, of Blackwood was arrested by Cpl. Jerry Houck on a fugitive warrant from Maine on July 20. Brijeshku S. Patel, 28, of Galloway was arrested by Ofc.Vincent Ceci for DWI on July 21. Amanda L. Mayer, 23, of Galloway was arrested by Ofc. Dominic Fabrizo for hindering apprehension on July 21. John J. Thompson III, 23, of Galloway was arrested by Ofc. Scott Winneberger and Ofc. Dominic Fabrizo for obstruction and resisting arrest on July 21. He was arrested again for aggravated assault, possession of a weapon, and possession of other weapons on July 22 by Det. Ryan Goehringer. Nicholas R. Tancredi, 23, of Linwood was arrested by Ofc. Bill Kline for possession of less than 50 grams of marijuana on July 2. Djuan A. Dobson, 25, of Galloway was arrested by Ofc. Scott Winneberger for hindering apprehension on July 22. Patricia R. Eberle, 47, of Galloway was arrested by Ofc. James Mullholland for driving while suspended with two prior DWI convictions on July 24. Daniel J. Camp, 21, of Galloway was arrested by Ofc. Steve Vernon for eluding police and obstructing the law on July 25. Daury J. Pena, 25, of Bronx NY was arrested by Ofc. Kerry Baerman for DWI on July 25. Aaron D. Kizer - Goff, 30, of Galloway was arrested by Ofc. Hiram Melendez for shoplifting on July 25 and receiving stolen property on July 26. Brian K. Rosario, 18, of Egg Harbor Twp. was arrested by Sgt. Joe Picardi for possession of CDS on July 26.